We decided to check out a shore spot right by one of the decommissioned bridges. This area has a rubble bottom with some sand patches, a few boulders and beds of seagrass. I was hoping to find a couple new species of porgy here, plus some new grunt species. Everything would be new species for Michael. It took a while to set up my gear. In the meanwhile, Michael had already landed a Littlehead Porgy. I’ve caught that species before so at least I’m not missing out. A few more White Grunt later, I had a nice little surprise. I’ve caught Lane Snapper before but had a poor picture of it. It was my target to catch some to photograph…and I didn’t expect to catch one so soon. 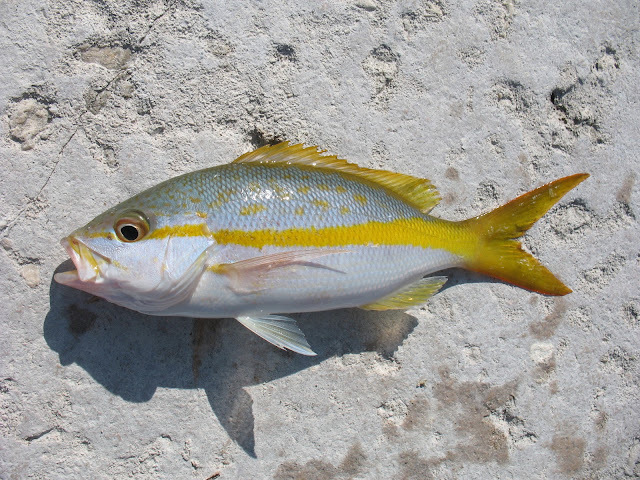 A couple of casts later, I caught a Yellowtail Snapper. Just like the Lane Snapper, it was a species I needed a photograph for my record…and now there is a stunning picture! Although the sabiki was doing fairly well, I want to catch my porgy species. I started fishing a dropper loop with squid, and found a Littlehead Porgy…not a new species. Porgy are very strong for their size and they are a lot of fun! Not too long later, I had another stronger fish on line again, and it was a Southern Puffer! At around 11pm, the current started to build on the incoming tide. The water was littered with seagrass and it was difficult to fish the dropper loop. I returned to fishing the sabiki and found a Hairy Blenny. I’ve caught a female of this species before. Now I have a picture of the male of the species. I was fishing the sabiki tight against the ledge along the sea wall. Many little Sergeant Majors and other damselfish were hiding under the ledge. Occasionally, something else were hiding there, including a juvenile Black Grouper! I saw a Black Grouper in 2010, but since they were out of season at the time I did not target it. Although Black Grouper was out of season even now, this was an incidental catch. This is a picture of another larger juvenile Black Grouper I caught the next day. While fishing the dropper loop, I had a couple of cowfish follow the larger chunk of squid. 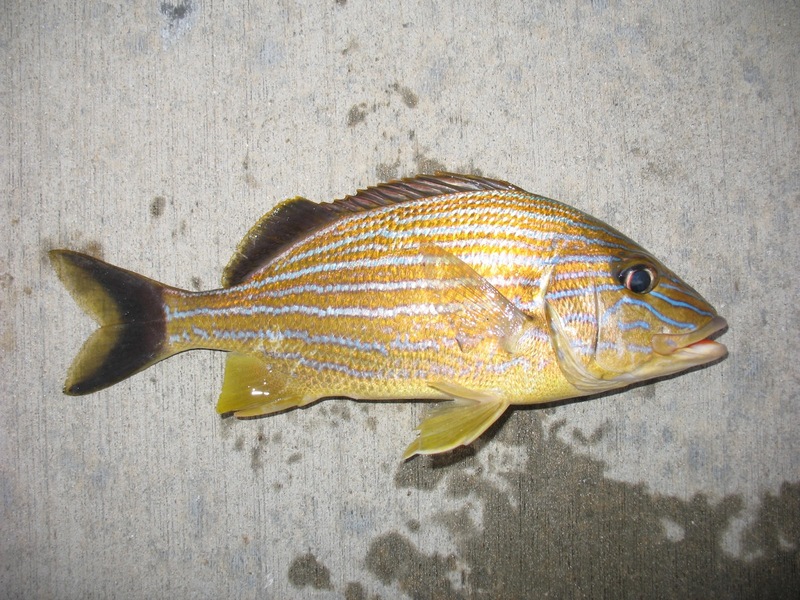 When I was fishing along the sea wall, a cowfish came out of nowhere and bit the sabiki! On the first bite, it striped the squid tentacle off the bottom sabiki hook. I dropped the sabiki down fully and the fish started nibbling on the second sabiki hook on the slack line…and when I was confident the fish took the entire hook in the mouth, I set the hook and the cowfish gave a spirited fight! With increasing current, small grunts were found holding around a large rock. We started catching the small grunts to keep as bait. When the tide finally reach slack high, we had about 10 small grunts. Since the slack tide shut down the bite, we decided to grab lunch and headed to another spot near a bridge to try our hands at some big game shore fishing. This bridge spot was suggested by a friend. He told me that the first and second bridge support often hold Goliath Grouper, and the water in the area is very sharky. We set up a 6/0 reel loaded with 260 yards of 60lb mono, topped with 30 yards of 100lb mono, and tied on a Carolina rig using an 8oz egg sinker to a 310lb barrel swivel that was part of a 180lb single strand steel leader. At the end of the steel leader was a 10/0 circle hook. This was our “big game rig”. I could cast this rig about 40-50 yards, but accuracy was pretty poor. So before we deploy this rig out, we cast out small grunts using 3/0 and 4/0 size gear. We put a 14” hound fish on the big game rig and dropped it from the bridge to the first bridge support. We were fishing an outgoing tide. Our bait were dropped in the eddy behind the bridge support on the down current side. We were hopeful that a shark or a Goliath Grouper would come knocking. However, throughout the tide change and the evening, the rig sat silent. When Michael caught a Schoolmaster Snapper, we dropped it as a livebait and even that was not bit. Meanwhile, both Michael and I had a couple of rips on the small grunts. In both cases, the fish ripped the grunt off the 5/0 circle hook. We could only guess what it may be. When it was dark, Michael found a couple of Schoolmaster Snappers just under legal size around the bridge support. I was looking our livebait well to see how many grunts were left when saw a moray eel nosing around. By the time I got a rig ready the eel had left. However, an hour later, I saw an eel hiding right amongst the rocks close to shore. I managed to get it to bite with the head of a squid. I was successful in pulling the eel out of the rock, but while waiting for Michael to clear his line and step back so I can swing the eel onto shore, the eel cut my 30lb mono with its sharp teeth. That eel could have made some wonderful shark bait! We fished until 10pm with very little action. At the end, we decided to call it a day and return to the hotel for the night.